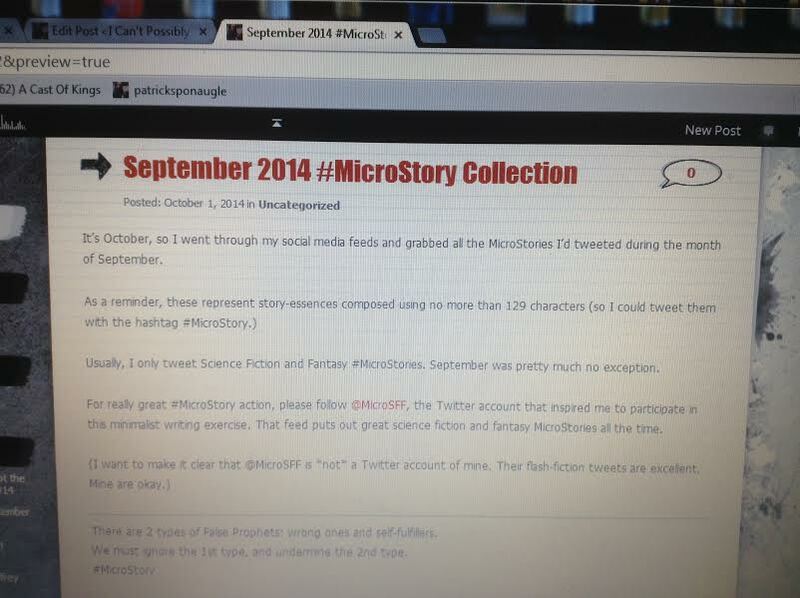 It’s October, so I went through my social media feeds and grabbed all the MicroStories I’d tweeted during the month of September. There are 2 types of False Prophets: wrong ones and self-fulfillers. We must ignore the 1st type, and undermine the 2nd type. The circuit was repaired. Model 2’s eyes lit up. The sportsmen showed up with their camos and rifles, not realizing the town’s “Centaur Hunting Season” signs were a warning. Fearing his ability to summon vengeful ghosts, the kingpins called for his death, but only unskilled assassins would attempt it. The elf & the orc awaited the bear’s arrival. The crowd of dwarves roared. “It’s not our first time chained together,” she said. Tired of being called “big orcs” or “little giants”, the ogres vowed to eradicate both races. The ship introverts were naturals for the lonely maintenance work near the hull. No one noticed when they stopped reporting in. Thanks, Sue! The centaur story got the most positive response last month also on Twitter/Facebook.